The ascent to the Passo di Giau from Cortina d'Ampezzo is splendid. In my opinion, the Giau offers the most beautiful views among the passes in the Dolomites. From the highest point you will see gorgeous mountain massifs in all directions, too many to mention them all, located nearby and far away. The road towards the pass is also superb. The ride begins in Cortina d'Ampezzo at the bridge across the river. The first two and a half kilometers are mostly running through inhabited areas but already offer many views of the mountains all around. Then the road enters into the forest to reach, about three kilometers further ahead, at Pocòl, the place where the road bifurcates to the Passo di Giau and to the Passo Falzàrego. So far, the road is nowhere really steep and traffic is too dense. The second problem is solved after the fork because most traffic goes to the Falzàrego. 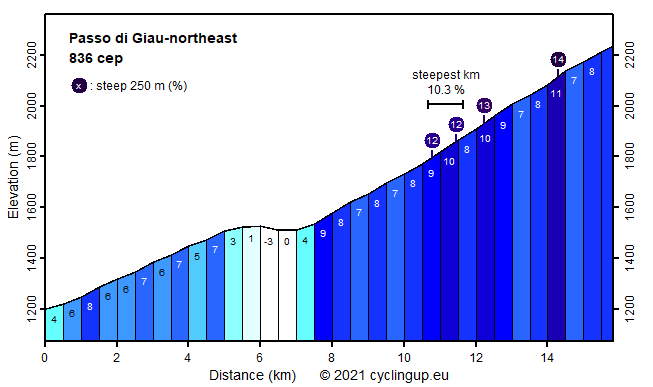 The first problem is not immediately solved because, in the first two and a half kilometers after the fork, the road to Giau barely rises and even contains a short descent (31 elevation meters). After that, the road becomes really steep with a lot of variation on small scales. On the remaining eight kilometers to the pass, the average gradient is 8.4% but four times there is a section of 250 meters in length with a slope of at least 12% (maximum 14%). The road is winding. That remains the case until the pass, where we may, if the weather allows it, enjoy the wonderful view described above.